﻿ How to Show Up on the First Page of Google » Red Mango Marketing! To say that most small businesses aren’t using search marketing to their best advantage would be a major understatement. It would also be untrue. The real truth is that most small businesses aren’t using search marketing at all. They fear it’s too complicated. Can small businesses really influence search results? No matter how small your business, you have the power to climb Google rankings — just by taking a few key steps. You can make it easier for new customers to find you online and turn online search into one of your most profitable marketing channels. With seven out of ten website visits coming from online search and 18 percent of local mobile searches leading to a sale within one day, ignoring search is consistently costing you business. But that changes right now. Join us for our upcoming free webinar: How to Show Up on the First Page of Google (And Get More Business from Your Website) to learn how to influence search results and turn search into one of your top sales channels. I’ll show you how search engine optimization allows you take control of Google rankings and show up online. 1. Write quality content consistently. There’s no way around this one. Getting search engine optimization right starts with writing content that directly addresses your customers’ problems, interests, and questions. When someone searches for a solution to their problem, you want your business to show up with a helpful resource. For example, at Constant Contact we know the holidays are a busy time for small business owners. They’re looking for an easy way to reach their customers and get the word out about their special holiday promotions. The best way to come up with content ideas is to keep an ongoing list of questions your customers or prospects ask you. Make note of what your audience is interested in and consistently write blog posts to answer these questions. Once every two weeks is a good starting point — more frequently is even better. Social media listening: Keep tabs on what people are talking about related to your business on sites like Twitter, Facebook, and LinkedIn. 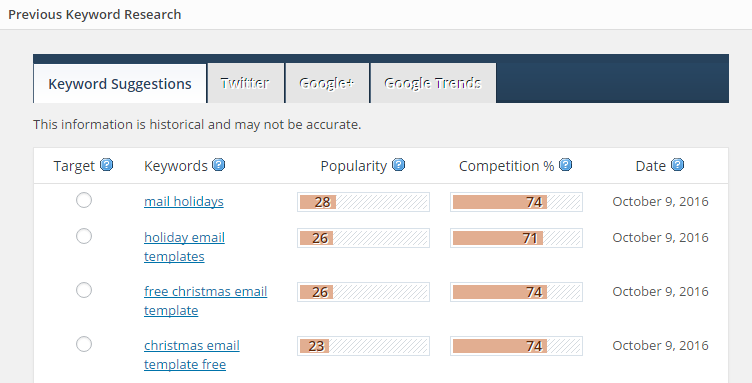 Competitive analysis: See what topics your competitors are covering on their sites. How can you put your own spin on these topics? Online surveys: Ask your audience what topics they’d like to learn more about from you. 2. Optimize your content for search results. Once you’ve written your post, look for opportunities to optimize your content for popular keywords. Use a tool like Google Keyword Planner or Moz’s Keyword Explorer to research which search terms are popular, related to your content topic. These keyword tools might even help you identify new topics to write about. If you see a related search term you haven’t targeted yet, jot it down for a future post. The perfect keyword has high popularity and low competition. But most importantly, the keyword has to be relevant to your audience and your content. 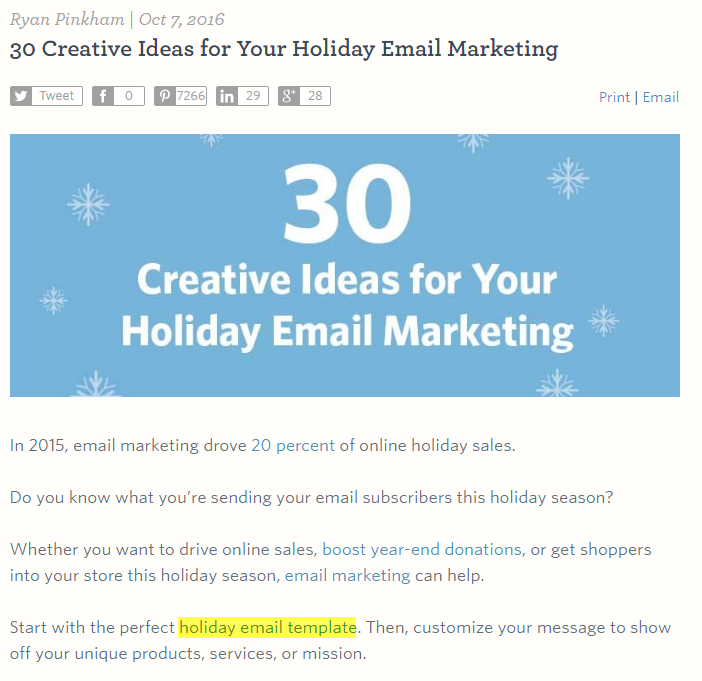 For our holiday email blog post, I decided to target the keyword phrase “holiday email templates.” Even though the popularity and competition numbers weren’t ideal, this term was the best descriptor. I also used Google Trends to see if the search popularity picked up during the holiday season. As it turns out, there are big spikes in search popularity for this term every year from October-December. Include your keyword in your content. Tip: Read this post for a comprehensive look at 5 On-Page SEO Factors All Small Businesses Need to Focus On. 3. Drive traffic to your content. Search engines prioritize quality content that has an active audience. Promote your new post to your email list and your social media following. Then, look for opportunities to link to your post on other areas of your site. Internal linking will drive more traffic back to your post and help the post build authority. Blog posts that are linked to frequently have a better chance of ranking well on search engines. We included our holiday email post in our Hints & Tips newsletter, shared it on our social media channels, and added it to our Holiday Headquarters page. Search engines like relevant, up-to-date information. If some of your older content is starting to get out of date, make updates to retain accuracy. You might even want to occasionally republish content to benefit from a fresher timestamp. 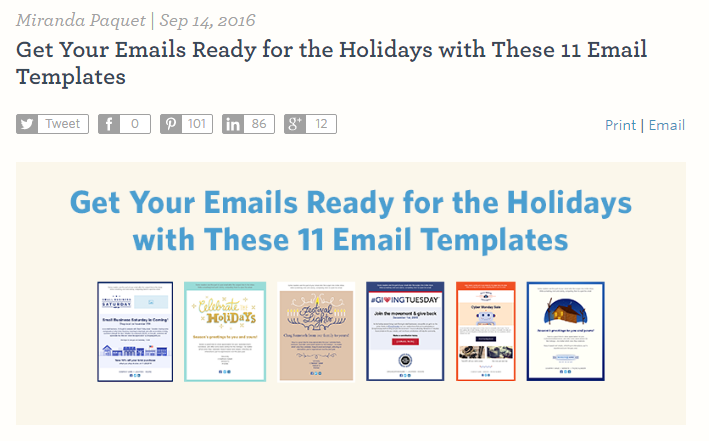 For example, if we release new holiday templates next year, we’d likely update and republish our existing post, rather than publish something brand new. This will ensure that we still benefit from the optimization we’ve already established. If you’re considering republishing an older piece of content, simply make your updates and add an editor’s note describing your changes. Is all this really worth the effort? 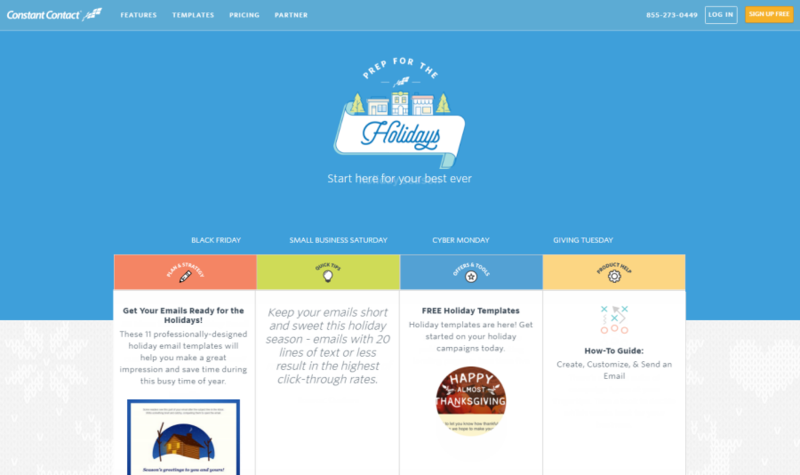 So far, our holiday email template post has driven 20 trial sign ups. As we get closer to the holiday season, we expect those numbers to jump even higher. Most businesses haven’t even scratched the surface of what search marketing can do for them — don’t let your business be one of them. 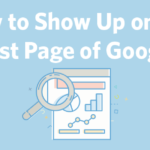 Join us this Thursday for a deeper dive into search engine marketing during our FREE and brand new webinar: How to Show Up on the First Page of Google (And Get More Business from Your Website). Even if you can’t attend live, register anyway and we’ll send you a recording. Have specific search questions we can help out with? Leave us your questions in the comments below. The post How to Show Up on the First Page of Google appeared first on Constant Contact Blogs. This entry was posted on Monday, October 10th, 2016 at 12:00 pm	and is filed under Google+, News & Updates, Online Marketing, Search Engine Optimization, SEO. You can follow any responses to this entry through the RSS 2.0 feed. Both comments and pings are currently closed.